General Discussion / Hi, I recorded a video of myself pixelling. Hello! I very rarely do personal pixel work nowadays so I thought the once that I got the chance I might as well share it with the kind Pixelation folk. This piece of artwork comes with a very fascinating story you can read up on the Wiki here. Also, it's worth mentioning that aside from the spiritual confluence that I feel towards Blake, he's also a far-back in time ally to us pixel artists as his work is mostly in miniature. 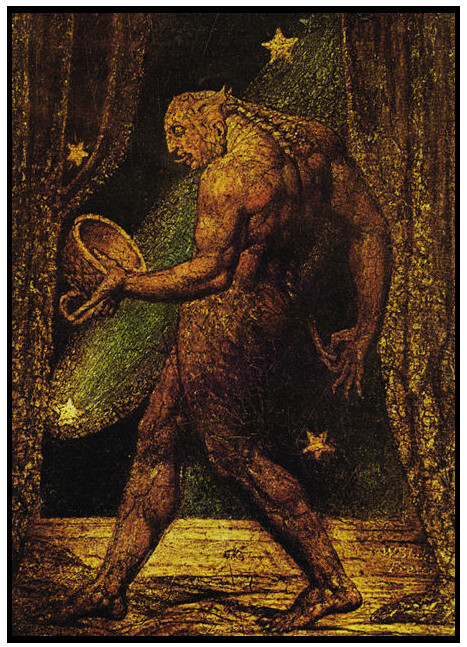 This picture is actually TINY, I've seen in in real life in the Tate in London. The video is in the timelapse style. Actual session was 2 and a half hours long, so if you set the speed to about .25 you're getting a fairly realistic (though low framerate) representation of the actual decision making in real time. Or just watch it at fast speed and chill out to the nice music and think 'huh, art is very easy to make, it just magically appears!'. Ultimately what I'd like to do is not so much timelapse but real-time videos where I talk on top and explain my thought process and the cluster solutions I come up with. More like a lecture, less like a 'look at this conjuration' kind of thing. Ideally I'd like to do some critique and editing on art people send in. Would there be interest in that? Not looking for critique because I don't think I'm going to touch up on it. But I thought someone might enjoy watching it as a cluster study, perhaps. There's very few single pixels, as per usual with my approach to pixel art. I started out in a 4,4,4 bits per channel color space to mimic the SNES specs that ultimately inspired this but towards the end I broke from the restriction and did very minor color correction in an 8,8,8 space. General Discussion / Mark Ferarri on 8-bit pixel art. GDC talk. Must watch. This is not necessary to learn pixel art. It's not the only way to get where you want to go. These are just the insane kinks of a strange man. So, now that's out of the way, if you're still reading you probably know what's up. For work recently I drew an irregular tile, which then I found was too dense, too realistic for the art direction of the game. As you would expect, this also tiles. In any case, a solution to our problem with the game I'm working on was to double size this and clean it up further. Try to zoom in and really take a look at the way the pixels touch. You probably won't find too many single pixels either, but that's neither here nor there. 1. try to be creative with how you space shapes closer than two pixels away. Effectively, right after you've blown something up, you are creating a *subpixel distance* there. This is very, very powerful, but if you use it too much then you have achieved nothing by blowing things up 200% to begin with. Likewise, for any line or dot that is less that 2 pixels x pixels fat, you're effectively subpixelling. But on a stable, static image. Ponder the implications of that second power of detail as you do this. 2. make your cleanup with attention and creativity, you don't want it to look like some superSAI filter (or at least not too much, perhaps you like that look). Think a lot about how to solve shapes and curves as you're uprezzing. Are you going to make things more angular, or try to solve them with antialias? If you antialias, are you going to use single pixels? Will it weaken the effect if you do? Let's talk about this as people try it instead of me just infodumping leading ideas in this thread. General Discussion / Pretty neat tool that procedurally generates some tileworld archetypes. I like the idea and approach. I actually think the water tile tool seems like a legit base to start from even for pixel artists that like to do stuff by hand. I got a few questions about how I pick colors, something that I've been asked a lot, generally, but more important to me lately because I have something useful to answer with. Never was much for colours, honestly. On paper I am a black and white, ink or wash tone artist. I literally learned color through pixel art, and the idiosyncratic aspect of me was very interested in 'symbolic colors' from early on. I wasn't so much interested in realistic representation with color, instead I would use, say, a green tint as some sort of visual language (green for me for example is usually sickness, evil, depression, stuff like that - very common interpretations). 2. get a lot of hue representation in there, what we ended up erroneously calling 'hue-shifting'. Good sense on which hues to choose to move towards and through which grey steps I never felt comfortable that I could explain or 'teach' in any capacity. This isn't what this thread is about. When people, 5, 8 years ago would ask me how I choose colours, I didn't have anything interesting to say, I don't think. What I can tell you now is that my choice at that time of introducing a lot of grey slots between more saturated colors created a very certain 'look' that I wanted to move away in the last few years. And one of the tools I now use to do this (and I used it in this piece as well), is that I go in photoshop and use color balance somewhere in the middle of creating a palette. I'm sure you can do it in some other program, but the concept is the same. RGB sliders for shadows, mid and highlights, in a 24bit color space, regardless if you're going to end up with 16 colors or what. I did a lot of color correction, then back to manually changing every palette entry, then back to color correction, then back to manual editing. What is the benefit of this? It removes a lot of the muddy gray identity that a lot of my past art was left with. Nowadays I don't have this problem as much anyway because I do not use unlimited bit depth for my palettes so everything ends up quite saturated anyhow, but I know most pixel artists at this time are choosing their colors from a very large bit depth, so some sense of overarching tint would be useful for their process. The theory is very simple - when you're adding +2 to red in the middle part of the values, if it finds a 20,20,20 color (a gray) it's going to make it 22,20,20, so from a gray it is now a gray-with-a-bit-more-red. If you take it really easy with this process, you can get an environmental effect, something like a soft bloom to work even for your pixel art. As an activity, you could post pixel art (esp background art and tiles) that you think could benefit from this, before and after color correction and manual calibration. Is this making sense, do you get what I'm going on about? General Discussion / I am retiring as a moderator of Pixelation - Also, Changes! Hi! I've decided after many years that it's time for me to step down from active moderation. This shouldn't really warrant its own thread, but just letting everybody know because I'll be effectively demoted soon and I don't want anyone to think it's due to any bad blood or whatever with the rest of the moderators. Far the opposite, I have warm feelies for everybody involved. Here's the thing - I think Pixelation needs new blood on the managerial side. Every time we find new people to turn into mods, they are great additions but they can't fundamentally change Pixelation or move it forward because there's a lot of inertia they have to work against. I am part of that inertia! That we haven't had the Pixelation skin for years now is inexcusable, for example. And since I didn't learn css and finish the skin myself, it tells me I no longer have the drive to keep pushing Pixelation forward. And when there's lazy (or preoccupied, or, or, or) people on top, those that could really provide for dynamic change don't get their chance. So, I wholeheartedly urge the rest of the mods to take over - or if they want, recruit further from the userbase - and steer Pixelation to the direction it needs to go to remain vital and useful. I will be staying in Pixelation as a normal user, contributing critique (and getting critique) and various ramblings as usual. I will have no official powers whatsoever. To make this thread proactive, I urge everyone that is active on the forums to contribute as to how they'd like to see Pixelation carry on in the future, how they'd like to see it change for the better and what they'd like to keep the same. Thank you for your patience over all these years. I learned a lot. General Discussion / NEW CLUSTER STUDY THREAD! Alright, this time for something a bit different. I think I've honed in on the best possible challenge to learn good pixel art regardless of the style you want to employ. I want you to pixel something (or take something you've pixelled before and fix it) and to make sure there are no stranded pixels in the image. What do I mean by that? I mean that if there's a pixel of a specific color in your image, then there should be at least one adjascent pixel of the same color directly connected to it. I will accept 45 degree connections, but they should not be your only tool in solving the situations they come up. I strongly suggest a small palette because you'll lose your mind if you try this directly with something that has 32 colors or whatever. And I strongly suggest trying to represent a fairly realistic character or item to get the most out of this excercise. Be brave. As usual, avoiding banding of any type is your primary priority. It's very easy to solve any stranded pixel situation if you're just free to band everywhere, after all. Today at work I created a piece with very few single pixels and it suddenly clicked, for me. I've been pixelling for close to 20 years and only now it clicked for me, it's kind of ridiculous. Please try it. P.S. I will accept single pixels only if you can explain the reasoning behind using them (and "it was too hard to find another solution!" isn't a good explanation). For example, a specular highlight can not always be solved as 2x2 pixel or a 2x1 pixel. In those cases, use them, but they should be very few. Don't let yourself off the hook easily. I don't have any art that I can show you because I pixel professionally for 8 hours a day now but if you're really serious about bettering yourself, give it a shot. We'll discuss your findings as you post them. Start here and look at all his games, descriptions and art. It's a valuable historical resource for our medium. Pixel Art Feature Chest / GR#235 - THE CLUSTER STUDY THREAD! This is a critique thread, but not like the usual ones. Here we will post art (either ours or not, respectfully) where we marvel at great cluster composition and/or offer better solutions for problems in the clusters. This thread is not about animation, palette choice, style or whatever else, it's strictly about great use of clusters. For those that do not follow the Ramblethread, a brief definition of "cluster"
A group of pixels (more than 1 pixel) of the same color, making a shape. You can call it whatever you like, pixel group, brush stroke, pixel shape, pixel form, whatever. Just as long as we know what we're talking about. To understand what makes a good cluster (according to me, at least) either read the Ramblethread or follow this thread as it progresses and you'll figure it out. The purpose of this thread is to raise awareness of solid cluster usage for new artists coming to pixel art and old artists that want to branch out in what is often called 'new school' pixel art technique. 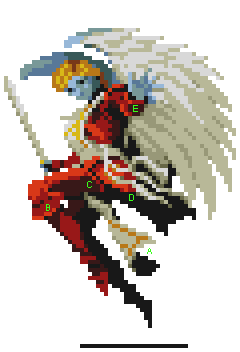 I'll start out with an examination of a sprite from Shin Megami Tensei for the SNES, which is from an age long past, decades before any 'new-school' even existed, or even the term 'pixel art' was floated. This is such a wonderful sprite. I'm going to focus on a few well done situations and then I'm going to do an edit on a few problematic bits. After reading the 'positives' below, I'm going to ask you to be proactive: study the sprite in your image editor and try to fix as many cluster issues as you see and remove banding. Then compare to my own edit to see what we did differently and why. A. Although the embroidery bands with the outline of the fabric, I think it's a fair trade because the fabric has great flow and the embroidery really adds to the holy warrior aspect of the sprite. The fabric convincingly is one three clusters. One is the big 'triangle' in the front with a taper towards and under the legs where just one single line width edge conveys the end of the shape. The complicated shadow under that single line width edge is another cluster, which bands a bit and can be cleaned up. The third cluster is the shadow of the fabric (right under the green "A") which also could be done with better pixel tech where it buffers into the primary cluster, but it's still very good. B. The main thing I love about this sprite is the armor. Given the few colors used, there's some broken outlines here (right over the "B") which I can live with because the mind fills in the gaps and can see it's a continuation of the shadow of the kneepad cluster made out of three pixels above and to the left of the B. There are other solutions to this, but I can roll with that. Right under the B we have a pretty brave cluster combination. The highlight of the edge of the armor meets the shadow of the whole kneepad, which is a triangular cluster with a strong vertical line. I just adore this sort of solution and do it in my own pixel art all the time. Strong and immediately visible for what it is. The boots of the sprite do not fare as well and are a complicated jumble of shapes, I'll address that in my edit. C. This is another armor edge which I love, look especially how the 45 degree cluster tapers with a darker red to round out the armor. Again, this sort of thing has been influential on me. I can even give a pass to the single red pixel right above the 'C' because the mind can see it's part of the buffer between the shadow cluster and the highlight cluster on top. There are more elegant solutions, still. D. This whole thing has some banding, but it's been admirably dealt with on the whole. We have here the continuous, flowing and bending single cluster of the back of the loincloth fabric, and ON TOP we have two stands of clothing flowing over it. As you can see again there's a single pixel line going through them, darkening and lightening itself according to its volume and a lightsource. The only thing to do over that is to remove some banding and make the bends even sharper, I would say. E. Again, armor and edge highlight. A foreshortened bracer works pretty well visually, I just love it. Only problem is an unfortunate vertical band where the edge highlight meets the shadow of the bracer. Also note that the two edge highlight clusters are the exact shame shape, which can be debated as a good or bad idea. There's still problems, but I hope some of my changes make sense. I am not involved with their product, but it's basically a better version of us trying to make hexels with real pixels. Worth looking at. Post art if you make it!